RMB City interviewded its first mayor UliSigg Cisse, see what the mayor and also RMB City’s facilitator say about RMB City and being a mayor of it…. 1.Why are you interested in RMB City? What attracts you about it? Because I will learn. New concept, new technology, breaking new ground for old boring questions like what is the piece, where does it start, where does it end, what is an exhibition, what is a collectible item. Pushing the limits is my game. And I am the facilitator…. And besides I really like to work with Cao Fei and Zhang Wei: they are mostly fearless people. 2. Why did you decide to collect this particular virtual building (“People’s Palace”)? What does it mean to you? If I collect I have to think big. It is the heart. 3. What ‘s the differences between this piece and other pieces in your contemporary art collection? Does it have a special meaning or function in your Chinese art collection system? It is meant to extend the scope of my collection into new space – virtual and real at the same time, collecting a process, bits, and real pieces. If it will not [extend the scope], and if it will not make me sweat, I will be upset. Actually I perceive myself more a researcher who is just fortunate to have means to acquire some results of his research. 4. RMB City is an open project, full of possibilities and creativity. It welcomes the active involvement of art institutions and collectors. Are you planning to be involved in this project, and if so, how? I already am. I am the Facilitator. Nobody knows what that means, it is so virtual, that we really like it… I am giving some ideas and some support to make it possible, that’s all. 5. How do you feel that the building you collected is going to serve as the RMB City Hall? 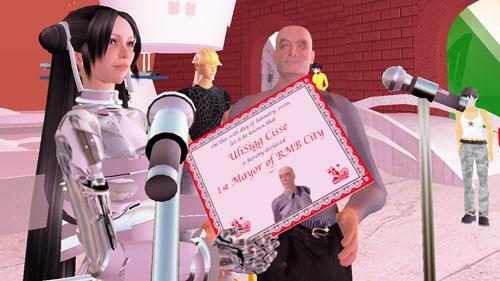 As the City Hall of a virtual city, what function do you think it should have? I like this idea even though it limits my own possibilities with my building. Which functions? A parking lot, an avatar-bar to get drunk in and envision new worlds, a mailbox to drop these visions… No hierarchy, no rules. 6. If you serve as the mayor of RMB City, how will you preside over the city’s development direction? I would certainly look like an excellent mayor, but I am born lazy. And the first thing I would have to introduce is hierarchy and rules: eliminate enemies threatening RMB City. Define cultural values, determine bad artists and bad art, avoid central government intervention, deflect Linden-$ crisis. Of course, also open up borders, go green and elect RMB super girl. Attract the best avatarminds. Do many competitions! These are any mayor’s secrets. 7. What do you think is the relationship between this virtual city and contemporary Chinese cities? Maybe none – but maybe we will be surprised and RMB City will be a role model. It will very much depend on the artist, the people collecting the buildings, and visitors. Will they still maintain their limitations ingrained by lifelong reality? Will they be able to think without boundaries? Then something new and useful for real Chinese cities may arise. 8. What is your concept of a Utopian city? sinoswisszurichbeijing – situated in the alps but with Chinese food, and no avatar with more than one vote – that would leave nothing to be desired.